Thanks to a double-lung transplant at Mayo Clinic, Logan McCaskill is breathing easier and on her way to a healthier future. University of Central Florida freshman biology major Logan McCaskill has her sights set on a career with NASA. 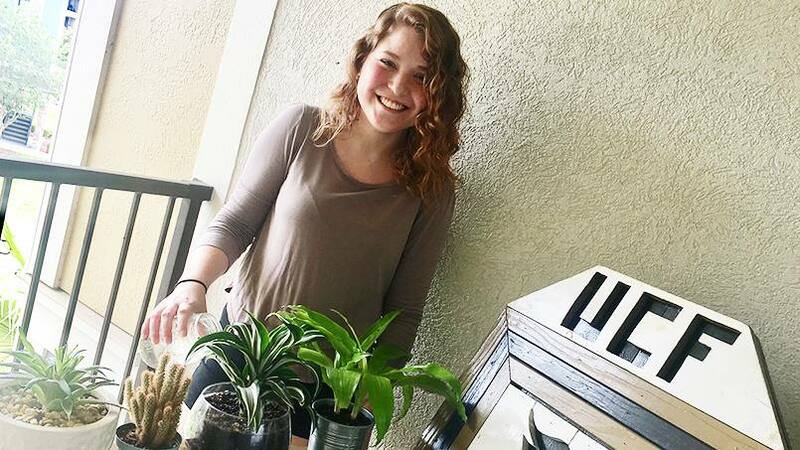 The Orlando native hopes to work for the agency researching how to grow plants in space. It's an ambitious goal. One she could never have dreamed of pursuing before a double-lung transplant at Mayo Clinic. Logan was born with cystic fibrosis, a disease that causes the body's secretions to become sticky and thick. Instead of acting as a lubricant, the secretions clog tubes, ducts and passageways, especially in the lungs and pancreas. Her older sister, Jordan, also was born with the condition. Despite the genetic illness, Logan says she had a pretty normal childhood — sleeping over at friends' houses, spending time at the beach, and going to Disney World. But starting at about age 8, the mucus that filled her lungs began causing repeated infections. By the time Logan entered middle school, she was being hospitalized for several weeks about twice a year. Logan had to wear a vibrating vest for 40 minutes a day to help break up the mucus from the walls of her lungs. She also saw a physical therapist to put pressure on her chest twice a day to help her cough up the mucus. People who have cystic fibrosis can experience nutritional challenges if the mucus blocks the tubes that carry digestive enzymes from the pancreas to the small intestine. Without these enzymes, nutrients from food are not completely absorbed. Because of this complication, when she was 9 years old, Logan was given formula nightly through a feeding tube to ensure she got the essential calories and nutrients her body needed. The frequent lung infections caused scarring in her lungs, and once Logan entered high school, her lung function had dropped so significantly that she had to carry a backpack with an oxygen tank. "It was so hard to breathe because my lungs were so damaged," Logan says. "I felt physically exhausted all the time. Even doing homework was exhausting." Halfway through her sophomore year, Logan was in an out of the hospital so much she had to leave school. Logan's sister had undergone a double-lung transplant at a Central Florida hospital when one of her lungs collapsed shortly after Christmas 2013. "We didn't want Logan to go through her transplant as weak as Jordan was when she went through hers," Logan's dad, Darrell McCaskill, says. "We wanted to look at other options." In early 2014, the family headed to Mayo Clinic's Florida campus for an evaluation in the Transplant Center. According to David Erasmus, M.D., a Mayo pulmonologist and lung transplant physician, Mayo Clinic performs 40 to 45 lung transplants per year in Florida, with a total of 556 lung transplants since 2001. Logan, then 17, met with Francisco Alvarez, M.D., a physician in Mayo Clinic's Lung Transplant Program, who gave her hope. "He was friendly, and very knowledgeable and informative. He assured me of the process and talked to me a lot about the recovery," says Logan, who was expending an average of 5,000 calories daily just to breathe. Logan was added to the transplant waiting list in May 2014. That began a long nine months for the family. Logan advanced to 11th grade and tried to stay positive. "I knew there was a chance that it might not work out," she says. Finally, the call came a little before midnight on Feb. 6, 2015. Two lungs were available. "It was surreal because I had waited so long," Logan recalls. "But it was also scary, because I was about to have this life-changing surgery." "I was excited for Logan because by that time, her oxygen tank didn't last enough for her to watch a movie," Darrell says. "There was nothing worse than waiting, especially when her health was declining so quickly." Once she was taken off the ventilator after the transplant surgery, Logan remembers taking in too much air with a single breath. "I wasn't used to breathing so deeply and having so much air capacity with my new lungs," Logan says. "I think it took about two to three days to really get used to breathing normally." Logan and her father spent three months in Jacksonville after her surgery, juggling school assignments and going to rehab three times a week. "She worked hard," Darrell says. "I knew she was in pain, but she knew she would have to fight through to get better." He credits Mayo Clinic's Transplant Center and the pulmonology group for Logan's successful surgery and recovery. "I can't say enough about them. They were knowledgeable and engaging. They were genuinely interested in Logan and her well-being," Darrell says. "She wasn't just a patient or a project to work on. They were vested in her." Logan was able to return to school full time to complete her senior year. "I had so much energy, and felt more focused and alert," she says. "I was able to go to homecoming and prom, and do everything else everyone my age could do." That includes graduating with her class. "Her graduation was a great day. She accomplished something that 90 percent of people probably wouldn't be able to do," Darrell says. "I'm just so proud of her." Two years after her transplant, Logan is enjoying college life and looking forward to the future. "I can now do anything I want, and my confidence is higher because of the transplant," Logan says. "I feel normal." Learn more about cystic fibrosis and lung transplants.